This hands-on color mixing workshop explores oil paint color combinations and how to use color theory to make natural looking paintings. This class will discuss and use color coding and chemical coding of oil paints. Expert instruction explains how paint chemistry works and which pigments to avoid to ensure the lasting beauty of your oil paintings. The workshop is offered in two sessions. The morning session covers color coding, color mixing and color theory. The afternoon covers advanced color mixing, value scales and paint chemistry. Cost is $35 for one session or $60 for the full day workshop. Sign-up at Alizarin Crimson Studio (772) 287-7030 or with Kate Wood (772) 287-0835. 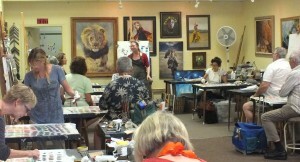 Kate Wood teaching color mixing. No student brands, like Winton or “hue” pigments. You can substitute with paint colors that you use more commonly. Alchemy Fine Art Restorers in Stuart, FL, provides a full range of world-class art conservation and restoration. 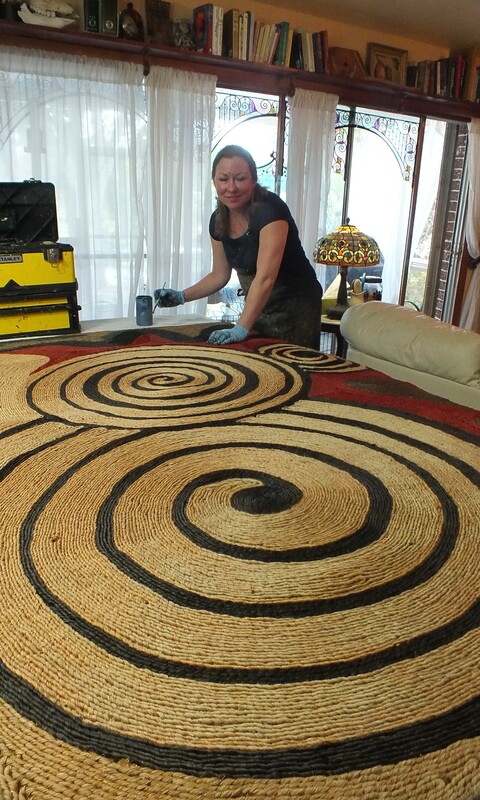 With over a decade of conservation experience and over two decades as a working artist, owner Kate Wood is a highly skilled technician. She expertly treats paintings on canvas, as well as conserving paper, pottery, leather, porcelain, woven fabric, and wooden objects. Kate is the only conservator on the Treasure Coast with the advanced painting, sculpting, and workshop skills to restore such a range. She cares about your precious objects and takes pride in returning them to their full measure of beauty. 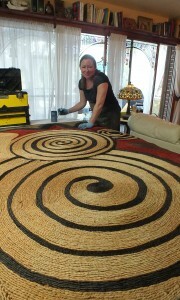 Kate Wood restoring a natural fiber wall hanging. Across two decades as an art teacher, master conservator, and oil painter, Kate Wood has learned how to get the most out of interactions with art professionals, including proven best-practices to avoid common pitfalls. Kate shares some of her essential tips for working with art professionals below. Whether you are looking to sell a work of art, commission a portrait, restore an object, or just find a frame that compliments your art, some basic rules from the owner of Alchemy Fine Art Restorers can save you money and ensure that you get the best possible results. When getting an art appraisal never sell your art to the same person who appraised it. Neither should you allow the appraiser to sell your art for you. Insurance companies require a expert third party opinion to determine the value of your art. Any monetary interest the appraiser has in the value of your art can undermine the integrity of your appraisal. If this happens to you, run the other way. The painting might be worth twice that. Reputable appraisers charge a per piece flat rate, not a fee based on a percentage of the appraised value nor an hourly rate. Neither should they release any appraisal information without prior consent of the client. The condition will affect the value of your art. For example, if a painting is dirty, ripped, or poorly conserved, it is worth less than one in good condition. When the painting was created in the context of the artist’s life, as well as its subject, will also govern its value. Certain periods in an artist’s production tend to be more sought after than others. An appraisal is not forever. It reflects the current, fluctuating art market. A document sale price even five years old is outmoded, and five years from now, your latest appraisal may completely change. Consider getting a second opinion if the person appraising your work also offers to restore/conserve the object. Unscrupulous persons might claim a third rate painting has a high value in order to convince a client to purchase expensive restoration services. Finding the value of a work is often simple. Numerous auction record sites are available online, including a free, searchable site anyone can use at Blouin Art Sales Index. If your exact object is not included in the records, find one that matches it as closely as possible in size and condition. Also, auction values fluctuate, so use the most recent record, preferably within the last five years. Note: Auction records represent a wholesale price. Dealer records are a retail price. When selling your art through a gallery, always get the agreement in writing. It could take months or years to sell a work of fine art. It’s important that you have a contract in place that explains the exact terms of your agreement with the gallery. For example, a gallery owner is tasked with appraising your signed Matisse print and asked to confirm that it is real in order to sell it. He is unable to get the work authenticated, but he sells it to another dealer for $5000, while implying that it could be real. Then, he tells you that it is definitely a fake and that he has an offer on the table for $1000. You agree to sell for $1000 (though the piece has already left the gallery). After the gallery collects the verbally agreed upon 35%, you end up with a mere $650 in store credit (which you may never use), while the gallery owner clears $5000! And what about the dealer who paid $5000? He already has a buyer lined up for his fake Matisse print. Read this site for more on commonly faked prints. Example #2: a gallery owner believes that your art would sell faster if it looked older. Without asking for our permission, he sprays an artificially darkened varnish over the entire painting. If his ploy to trick the buyer doesn’t work and the piece doesn’t sell, the art is irreversibly compromised. This is unacceptable on many levels. These cautionary tales would not happen with a legitimate contract in force. Such contracts are standard practice in reputable galleries and you should never deal with any gallery unwilling to provide one. This applies both to the professional artist selling original work and the collector selling pieces by another artists. To protect yourself, always require an original copy of a signed contract that says exactly what percent of the final sale the gallery receives. Most galleries charge a 30% to 50% commission for the sale of your work. Specify that if the art is sold at a discount, the difference come out of the gallery owner’s share, not your share. Stipulate that any alterations to the work, including restoration, varnishing, changing out any elements, etc. require your pre-approval. Also stipulate that you shall receive a signed receipt of the transaction between the gallery and the buyer, showing the exact final sale price. Each of these things can protect you from unscrupulous practices. Before you trust a gallery to sell your artwork on commission, photograph your object in good light, documenting the appearance / condition. Include close-ups of the exact frame you delivered. That way, should the object suffer any damage at the hands of the gallery owner, you hold proof of its original state. Always take measurements of both the image size and the frame size and document these. Make copies of all receipts or histories of the work. This is its provenance and is very important to the sale of a work of art. Give the dealer the copies of receipts. Upon final sale, give the originals to the buyer. This way, if the art work is damaged or even “lost” by the dealer, you have proof of your ownership. When working with a commission artist or muralist, ask to see a portfolio their work. Ask a portrait artist if they would like to photograph your subject. They may have creative ideas or scenes that they like to work with. Whatever you do, don’t use flash photography. It flattens the subject and steals color. If you hand an artist a yearbook photo, that’s what you’ll get. If it doesn’t look good in a photo, it won’t look good on canvas. If you are going to take a photo for the artist to work with, try to set the scene. Think in terms of background. Natural places, good lighting and being at the same level as your subject are all important. A phot0 looking down at a dog on a tile floor, for example, might make for a cute snapshot, but it’s not a very good subject for a portrait painting. Agree to a price up front and expect to pay a deposit. This protects you both. It’s fine to request a pre-signature viewing. If you like it, have them sign it. If there is something you would like changed, this gives you a chance to make that request. Don’t accept the work as final until you love it. When working with a muralist, ask for a to-scale sketch that you can approve. The sketch won’t be as detailed as the finished product, but it will give you an idea what your wall will look like. If you are working from a reference photo, make sure it is what you really want. Artists may have a hard time translating, “I want this field, but could you put two horses in it?” If that is what you want, get a good photo of two horses in a field. When working with an art conservator, look at their past work. Any good conservator has a portfolio of the type of projects at which they excel. Always be sure you understand the processes they will use to conserve your work. Don’t be afraid to ask questions if they are using technical terms or jargon. Always get an estimate of the work be done and what it costs, just like you would if you were taking a car in for repairs. I do not recommend paying the entire amount up-front. A deposit of half should suffice. Leaving half of the job unpaid is an incentive to the conservator to complete the task. Asking for a rough deadline is fine but a definite date may be difficult to pin point. The cleaning may expose previous repairs that require more attention. If a painting took two hundred years to come to a state of disrepair, it will take more than two weeks to turn that around. Be patient. It’s worth the wait. It’s not unreasonable to ask for a mid-restoration photograph, however, to see progress on your work. I recommend this. It’s also wise to take your own “before” picture, so you can compare the state of disrepair with the results you paid for. Choosing a frame for your art can be a confusing task. There are so many choices and ways to frame an artwork. First, it is very important to frame to the best advantage of the artwork, not to match the sofa. The art will (hopefully) far outlive furniture trends. A frame is like a dress on a woman, the more befitting the dress, the prettier the woman. The more flattering the frame, the more beautiful the artwork. One general rule off thumb: don’t use a frame darker than the darkest dark or lighter than the lightest light in the painting. It’s a distraction from the piece. It’s equally important to ensure the longevity of the piece. Works on paper should be framed in an acid-free environment. Reputable frame shops offer this alternative. It may cost a little more, but it ensures the long-term stability of the paper. Works that were framed many years ago were most likely framed with acid content mats and cardboard. They should be replaced with acid-free backing and matting. If you look a the beveled edge of the matting and it is yellow or brownish, it has an acid content. All artwork and photos should be framed so they don’t touch the glass. Mat board or spacers will keep humidity from making the artwork stick to the glass. Pastels should be framed with a reverse bevel, so any dust that falls from the drawing will fall behind the mat and not dirty the overall look of the framed work. It is important to frame oil paintings, not just to beautify the work, but also to protect them. I discourage papering the backs of oil paintings. Many framers do this to present a finished look and hide the screws and clips. Over time, this acid content brown paper degrades and falls into the back of the stretcher bars. The paper also traps humidity which gives mold and mildew a nice, comfy place to thrive. Framing can be expensive. Every step from creating the frame’s finish to fitting is a specialized skill. Good framing is worth the cost, as it will serve the artwork for the span of its life, allowing many generations to enjoy the piece. However, this does not mean you necessarily need to purchase the most expensive frame in the shop. If the framer shows you a frame that is $76 per foot, ask to see less expensive options as well. It could be that a frame at $22 or $12 per foot, which has the same essential profile, will flatter the work as well. For example, not every framed work of art needs gold leaf gilding, when metal leaf will suffice. Even some painted finishes are attractive. Purchase the frame that fits both the art and your budget. We hope you’ve enjoyed these tips for working with art professionals. In summary, don’t be afraid to ask questions and always get it in writing! Alchemy Fine Art Restorers owner Kate Wood will present an overview of art conservation to one of the world’s top organizations when it comes to restoring historical treasures. Kate will present to the Treasure Coast Chapter of the Questers on Wednesday, 12 February 2014. Attendees to this members-only event can bring example objects in need of restoration or cleaning for discussion on how they would be approached from an expert conservator’s point of view. Objects should be of a manageable size and weight. Kate will also share some insight into the tools of her trade as well as her philosophy of fine art restoration. Aside from their charitable support of area historical foundations, the Treasure Coast Chapter hosts an annual antique show in downtown Stuart, FL, which has raised funds to restore the Stuart Feed Store Museum, the House of Refuge, the Lyric Theatre, the Victory Museum, the Children’s Museum, the Mansion at Tuckahoe, and others. For more information, visit www.floridaquesters.org.